Ducati Desmofighter at 2009 Milan Show? Ducati has knocked us out for the last couple of years at the Milan EICMA motorcycle show with bold new models. 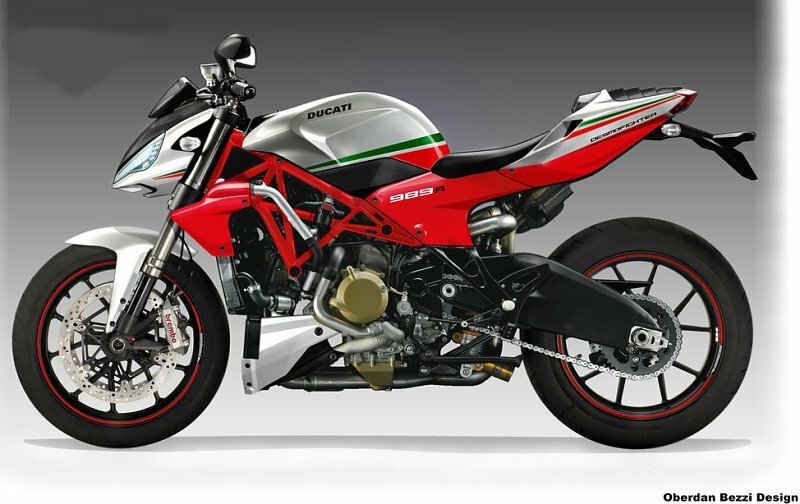 The 1098 superbike appeared in 2006, a new Monster went on stage in 2007, and 2008 brought the beefier 1198 along with the Streetfighter, a bike that may be the final word in high-performance naked bikes. How do you top that? Why not take the MotoGP-based Desmosedici D16RR and make that into a hyper-charged “Desmofighter?” I can think of several reasons why not, mainly involving things like intensive care units and the sort of attorneys that advertise on bus-stop benches. But I am not Italian. Designer and MD’s Chief Imagination Officer Oberdan Bezzi is, however, and in his mind’s eye a 200 hp V-Four naked bike makes perfect sense. Heck, Ducati has all the parts to make one of these things in their factory right now, although why not make it with the new carbon-fiber frame seen on the 2009 racebike? What’s that you say? Because it’ll cost more money than the aggregate real estate value of 7 Kansas counties? That’s a good reason. You can see more of Oberdan’s doodles at his blog. I still think & will remain thinking a “Streetfighter” based on the smaller/lighter/lower reciprocating mass 848 Superbike (rather than the chosen 1098cc) would be a more preferable & better overall balanced ride except for torque in the lower half powerband. Reiable sources state racers below pro level get quicker lap times on the 848 vs. the 1098; if true then the sum total reason Ducati chose the larger 1098 (again, except for torque in the lower powerband) is marketing, as in bigger is better.